One of the big things and reason for this blog is that we take classic comfort foods and make them gluten-free. It’s easy with a recipe like this to make sure that it is also naturally dairy-free, too. I think just about everyone loves a teriyaki marinated chicken kabob. A classic comfort food for sure. They are really easy to convert to gluten-free by making a homemade teriyaki sauce using GF soy sauce or coconut aminos. Whisk the ingredients together and store in fridge. You could also buy a pre-made teriyaki sauce like Coconut Secrets Coconut Aminos Teriyaki Sauce. It is Organic, Soy-Free, Gluten-Free, Dairy-Free and Non-GMO. Then for the chicken kabob marinade, add some pineapple juice, pineapple chunks, fresh chives and some spices to the teriyaki sauce. Marinate in the fridge for at least six hours. They come out so tender and delicious! 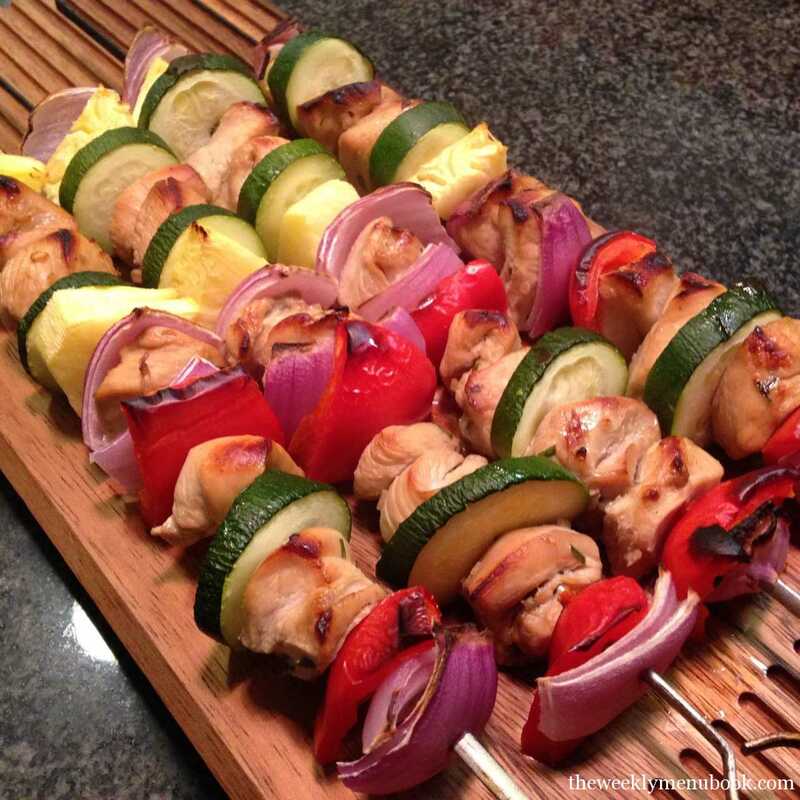 We add veggies that have lots of color like red bell peppers, zucchini, red onion, and fresh pineapple chunks to the skewers with the chicken pieces. Then grill ’em up! Make one of your favorite comfort foods, teriyaki chicken kabobs, with a gluten-free teriyaki sauce marinade, pineapples and lots of colorful veggies. Combine gluten free teriyaki sauce and marinade ingredients into a medium size bowl and stir. Cut up the chicken into small pieces and add to the marinade. Cover and let sit in the refrigerator for at least 6 hours. When ready to grill the chicken, first cut the bell pepper, zucchini and onion into pieces. Skewer the veggies and chicken onto metal skewers. Grill skewers for 15-20 minutes or until chicken is done. 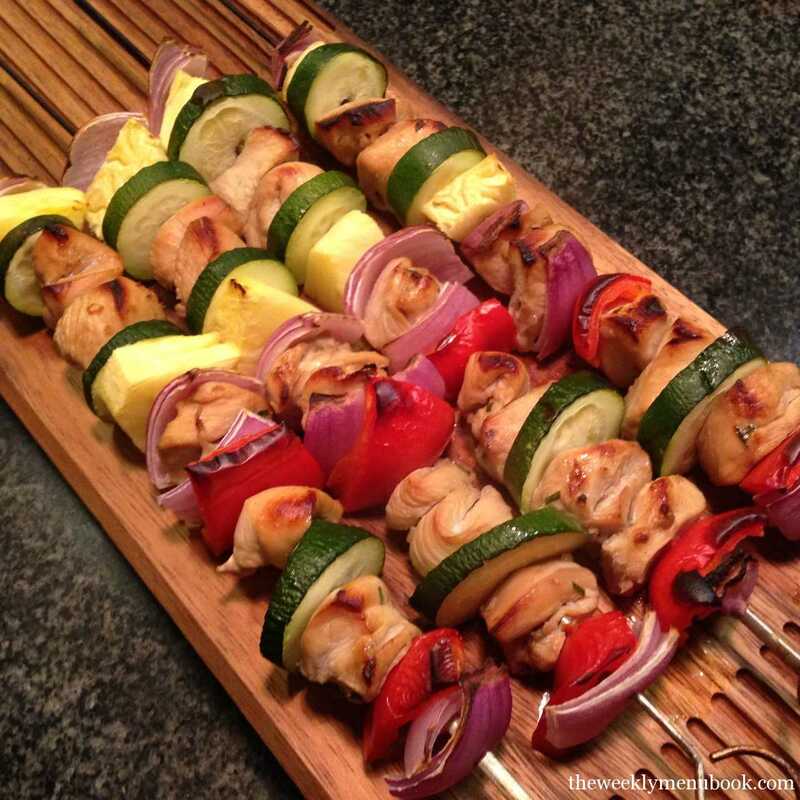 Want More Recipes Like Teriyaki Chicken Kabobs?